The leaders of Russia and Norway resolved a 40-year-old dispute over dividing the Barents Sea and part of the Arctic Ocean into clear economic zones extending to the edge of Europe’s northern continental shelf. 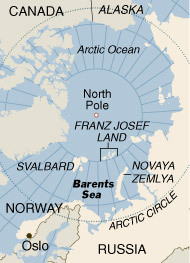 The agreement could herald oil and natural gas exploration in a huge and potentially lucrative region.When Russian scientists planted a flag on the seabed at the North Pole in 2007, it seemed that a “race to the Arctic” was on, with northern nations aggressively jostling for the right to exploit resources that were previously out of reach. This entry was posted in Natural Resources, News. Bookmark the permalink.